This example illustrates how you can use PROC NPAR1WAY to perform a one-way nonparametric analysis. The data from Halverson and Sherwood (1930) consist of weight gain measurements for five different levels of gossypol additive in animal feed. Gossypol is a substance contained in cottonseed shells, and these data were collected to study the effect of gossypol on animal nutrition. The data set Gossypol contains the variable Dose, which represents the amount of gossypol additive, and the variable Gain, which represents the weight gain. The variable Dose is the CLASS variable, and the VAR statement specifies the variable Gain is the response variable. The CLASS statement is required, and you must name only one CLASS variable. You can name one or more analysis variables in the VAR statement. If you omit the VAR statement, PROC NPAR1WAY analyzes all numeric variables in the data set except for the CLASS variable, the FREQ variable, and the BY variables. When no analysis options are specified in the PROC NPAR1WAY statement, the ANOVA, WILCOXON, MEDIAN, VW, SAVAGE, and EDF options are invoked by default. The tables in the following figures show the results of these analyses. The tables in Figure 71.1 are produced by the ANOVA option. For each level of the CLASS variable Dose, PROC NPAR1WAY displays the number of observations and the mean of the analysis variable Gain. PROC NPAR1WAY displays a standard analysis of variance on the raw data. This gives the same results as the GLM and ANOVA procedures. The p-value for the F test is <0.0001, which indicates that Dose accounts for a significant portion of the variability of the dependent variable Gain. The WILCOXON option produces the output in Figure 71.2. PROC NPAR1WAY first provides a summary of the Wilcoxon scores for the analysis variable Gain by class level. For each level of the CLASS variable Dose, PROC NPAR1WAY displays the following information: number of observations, sum of the Wilcoxon scores, expected sum under the null hypothesis of no difference among class levels, standard deviation under the null hypothesis, and mean score. Next PROC NPAR1WAY displays the one-way ANOVA statistic, which for Wilcoxon scores is known as the Kruskal-Wallis test. The statistic equals 52.6656, with four degrees of freedom, which is the number of class levels minus one. The p-value (probability of a larger statistic under the null hypothesis) is <0.0001. This leads to rejection of the null hypothesis that there is no difference in location for Gain among the levels of Dose. This p-value is asymptotic, computed from the asymptotic chi-square distribution of the test statistic. For certain data sets it might also be useful to compute the exact p-value—for example, for small data sets or for data sets that are sparse, skewed, or heavily tied. You can use the EXACT statement to request exact p-values for any of the location or scale tests available in PROC NPAR1WAY. Figure 71.3 through Figure 71.5 display the analyses produced by the MEDIAN, VW, and SAVAGE options. For each score type, PROC NPAR1WAY provides a summary of scores and the one-way ANOVA statistic, as previously described for Wilcoxon scores. Other score types available in PROC NPAR1WAY are Siegel-Tukey, Ansari-Bradley, Klotz, and Mood, which can be used to test for scale differences. Conover scores can be used to test for differences in both location and scale. Additionally, you can specify the SCORES=DATA option, which uses the input data as scores. This option gives you the flexibility to construct any scores for your data with the DATA step and then analyze these scores with PROC NPAR1WAY. The tables in Figure 71.6 display the empirical distribution function statistics, comparing the distribution of Gain for the different levels of Dose. These tables are produced by the EDF option, and they include Kolmogorov-Smirnov statistics and Cramér–von Mises statistics. PROC NPAR1WAY uses ODS Graphics to create graphs as part of its output. The following statements produce a box plot of Wilcoxon scores for Gain classified by Dose. ODS Graphics must be enabled before producing graphs. 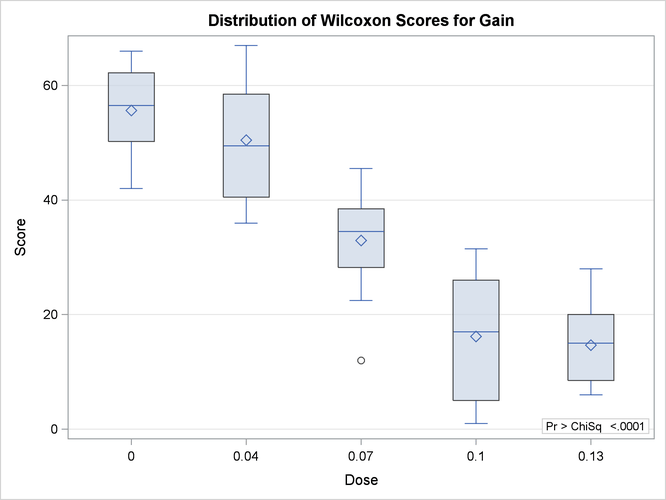 Figure 71.7 displays the box plot of Wilcoxon scores. This graph corresponds to the Wilcoxon scores analysis shown in Figure 71.2. To remove the p-value from the box plot display, you can specify the NOSTATS plot option in parentheses following the WILCOXONBOXPLOT option. Box plots are available for all PROC NPAR1WAY score types except median scores, which are displayed in a stacked bar chart. If ODS Graphics is enabled but you do not specify the PLOTS= option, PROC NPAR1WAY produces all plots that are associated with the analyses that you request. The tables in the following figures show the results of this two-sample analysis. The tables in Figure 71.8 are produced by the ANOVA option. Figure 71.9 displays the output produced by the WILCOXON option. PROC NPAR1WAY provides a summary of the Wilcoxon scores for the analysis variable Gain for each of the two class levels. Since there are only two levels, PROC NPAR1WAY displays the two-sample test, based on the simple linear rank statistic with Wilcoxon scores. The normal approximation includes a continuity correction. To remove the continuity correction, you can specify the CORRECT=NO option. PROC NPAR1WAY also gives a t approximation for the Wilcoxon two-sample test. Like the multisample analysis, PROC NPAR1WAY computes a one-way ANOVA statistic, which for Wilcoxon scores is known as the Kruskal-Wallis test. All these p-values show no difference in Gain for the two Dose levels at the 0.05 level of significance. Figure 71.10 through Figure 71.12 display the two-sample analyses produced by the MEDIAN, VW, and SAVAGE options. The tables in Figure 71.13 display the empirical distribution function statistics, comparing the distribution of Gain for the two levels of Dose. The p-value for the Kolmogorov-Smirnov two-sample test is 0.6199, which indicates no rejection of the null hypothesis that the Gain distributions are identical for the two levels of Dose.